The Surprising Answer to What is Copywriting? ​Note: Additional commentary by Brian T. Edmondson are noted in italics. Copywriting is the skill — and field of work — where people write sales promotions and other marketing materials for products, services, fundraising campaigns, etc. It’s the craft of writing persuasive messages that prompt people to take action (buy something, inquire about a service, download a free eBook, donate to a cause, etc.). When it comes to marketing and advertising your business, copywriting is the single most important skill you should learn the master; whether you are doing it yourself or outsourcing it to a professional copywriter. 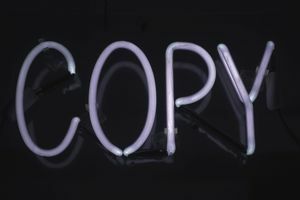 Copywriting is much different than typical writing, such as writing an article, blog post, or other pieces of content. Copywriting is a special craft of writing specifically geared towards getting someone to take some type of action (like making a purchase). You know that TV commercial you just watched before the evening news? A copywriter wrote the script for that commercial. How about the brochures you picked up at the local home and garden show? Yes, copywriters wrote those too. And the content on that website you just visited? Yup. One or more copywriters likely wrote the content on every single page of that site. These are examples of broadcast, print and online copywriting, and to be clear — copywriting is NOT about legal trademarks. Protecting one’s inventions or creative works is a copyright, a completely different topic. Now, Here's the Surprising Answer to "What is Copywriting?" Copywriting is a skill that’s needed EVERYWHERE today. It’s used in thousands upon thousands of materials and messages sent out to reach specific audiences, around the clock, every day. This means there’s an ongoing pool of marketing copywriter jobs for individuals who can write for a wide variety of projects. Traditionally, before the days of the Internet, copywriting was needed for about a dozen different types of marketing materials, including direct mail packages, postcards, newspaper and magazine ads, TV and radio commercials, brochures, posters, coupons, sell sheets (for sales reps to carry), and even cereal boxes. Today, the world of copywriting has exploded online as a critical component of 75 to 100 or even more different types of marketing tools and tactics, such as websites, email copy, online articles, social media posts, blogs, online ads, videos, webinar presentations, and so on. ​I could go on and on, but you get the idea. Every company that makes products, sells services or raises money needs good copywriting to compete for customers and dollars. For most businesses who do their own marketing, they just simply take their best guess at putting words into any of the above-mentioned forms of media. In many cases, they simply just borrow from other ads they see; which were done by people doing the same thing. It cannot be overstated that the words you use can have a huge difference between spectacular success and miserable failure; and that there is an entire field of study devoted to the mastery of copywriting. If you are considering outsourcing your copywriting you may find that the rate a copywriter charges is much higher than a regular writer. Again, this is because copywriters are specifically trained on writing copy that actually sells. You could pay someone to just write a blog post, but if that post does not effectively sell the product or service you are offering than what is the purpose of doing it in the first place? While more expensive, a trained copywriter can write a blog post that will actually generate leads, sales, or whatever the action you are looking for is. So Here's Another Important Question: What is GOOD Copywriting? Aha! There’s a big difference between so-so copywriting and effective copywriting. Effective copywriting is writing that works really well in driving responses and increasing purchases. Let’s look at five of the components of good copywriting, using a cat product to illustrate our points. If you’re promoting a product that provides fresh water to cats around the clock, the copywriting must speak to cat owners. In a one-on-one “conversation,” you’ll want to explain how the product solves the cat owner’s desire to provide fresh, healthy water. One of the best ways to improve your marketing materials is to stop trying to sound "super professional" and writing in the third-person. First person writing in a conversational tone works really well. If outsourcing your copy, you'll want to work a with a writer who has experience in your market and understands the wants, needs, desires of your market and know the type of langugage or jargon they use. Cat owners have thousands of product options to consider, so the copywriting must differentiate this cat-water product from any others available. What makes this the best solution (the easiest, safest, healthiest, etc.)? Many people refer to this as your USP or unique selling proposition. What makes you different from every other me-too product or service out there? To make sure cat owners don’t hesitate or worry that the product is not going to live up to its promises, it’s best to provide specific proof that the product works, such as customer testimonials, test results compared to other cat-water products, perhaps a marketing video on how easy it is to use, etc. If you're not using testimonials in your marketing, then start doing so immediately! If you don't have testimonials you can also cite facts from trusted authorities to support the claims you are making in your marketing and advertising materials. Good Copywriting Guides the Audience to an Appealing or Beneficial "Call to Action:"
Telling people exactly what they need to do next and why they should do it right now are two things every marketing piece you create should include. Offering bonuses, discounts, incentives and most importantly a reason why they should act now rather than procrastinate are extremely effective. A few simple copy changes can boost response by 10%, 20%... even 150%, so it pays to test different messages and offers. If you're not tracking everything you are doing then how will you know what's working and what's not? In addition, you should be constantly testing to see if you can improve the results you are already getting. You can browse hundreds of free copywriting articles on AWAI’s website, which includes expert tips from some of the top copywriters in the industry. This is also a great resource if you’d like to find out how to become a copywriter — one of the fastest growing career paths today for writers interested in making a good living doing freelance work from home or as a full-time staff copywriter for a company. About the author: Pam Foster is the Director of Copywriting Training at AWAI (American Writers & Artists, Inc.), which has been helping people develop skills to acquire financial security, independence and freedom since 1997. And as the world’s leading publisher of direct-response copywriting, travel writing, photography and graphic design home-study programs, AWAI has helped thousands of people do just that.